An editor’s job is often a thankless one. Those who stand between grammatical chaos and the unsuspecting public are called killjoys, grammar nazis, and soulless corporate minions. When the weight of all this negativity becomes too much, you can talk with your doctor about Prozac, or you can read this list of the Top Ten Snarky Editing Quotes from some of the most famous names in the writing business and enjoy a good laugh instead. And who better to start with than the ever-pithy Mark Twain? Contrary to what your English teachers told you, adjective-heavy descriptions are a faux pas in the book world. Editors usually cut descriptors with extreme prejudice and keep only those that are absolutely indispensable to the narrative. English has one of the largest and most diverse vocabularies of any extant language; there’s bound to be a word somewhere in the dictionary that’ll do the job better than a conga line of adjectives. Which would you prefer: a banana or a long, thin, curving, yellow-skinned fruit? Adverbs are as distrusted as their cousins the adjectives. Why travel the road merrily, resolutely, or quickly when you can go to hell with a single verb? Exclamation points jump out and demand attention! Therefore, editors usually allow no more exclamation points in a chapter, or even an entire book, than you can count on one hand. The same principle applies to italics. That’s right—in a tragedy of classical proportions, generations of writers have been raised on awkward rules like “never split an infinitive” because some elite cabal in Ye Olde Elizabethan Times decided that English should be more like Latin. This is what the internet calls “insane troll logic,” and you are free to completely ignore it. The laws of statistics dictate that there is always someone out there who clings to outdated Latinate notions of grammar, but most contemporary editors agree with Shaw. In practice, to needlessly split hairs and to split hairs needlessly are both a waste of time. The “rule” against ending a sentence with a preposition is another Latinism we can thank the Elizabethan cabal for. As Churchill demonstrated, in English this principle contorts sentences beyond all recognition, so throw it out with the unsplit infinitives and other nonsensical rules you learned in high school English. Any editor worth the title knows that good writing never states the obvious. Duh. Occasionally, you’ll work with a writer who is proficient with such esoteric matters as the proper use of semicolons. This seems like an editor’s dream come true, but the usual challenge with this author is convincing them to rein in their artistic flourishes and let the story speak for itself. 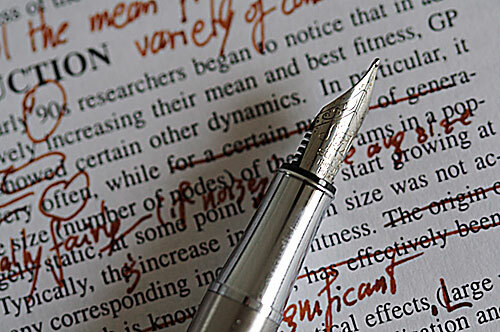 There’s more to editing than correcting mistakes in spelling and grammar—it’s as much art as science, and it hinges on one question: Is the writer saying what they want to say as clearly as possible? A good quote to remember when you and a writer have creative differences and they storm out wailing that they can’t work in these conditions. They may complain now, but once the book is published, the author will thank you for pushing them to make their story the best it could be. Whether you’re looking for inspiration, commiseration, or a good laugh, you can find other helpful collections of editing quotes on Scribendi and the Writers Digest site.